H x W x D: 1360 x 1350 x 770 mm. 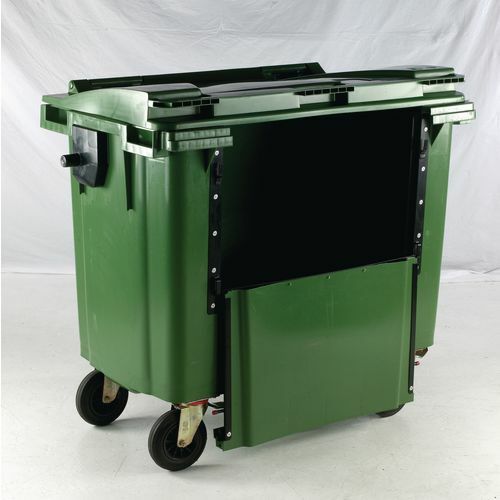 These waste bins are a great solution for outside refuse storage requirements, as they are easily accessible with the availability of the drop down front latch. The secured front latch with a lift and release function provides an opening with dimensions on 50cm high by 75cm wide, allowing waste to be deposited without having to lift it over the top of the bin. The lid can also be lifted to enable it to be used to full capacity when necessary. The full dimensions of the bin are a height of 136cm by a width of 135cm and a depth of 77cm. 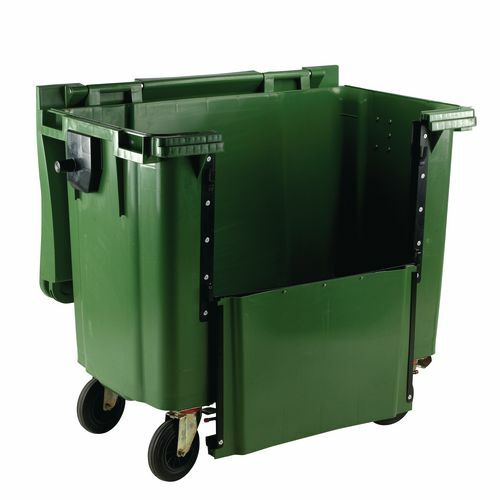 Ideal for anyone who needs large capacity waste storage, but who finds it difficult having to lift waste over the high sides of standard large waste containers. It is available in a choice of 4 colours, blue, green, grey and yellow. They are easily movable being on 4 wheels, making relocation of the bins for collection or any other reason that it may be required simple. These are tough and durable products, making them long lasting and they also come with a 12 month guarantee.